The former US Secretary of Defence, Donald Rumsfeld, recounts his time in Washington. Taking its title from the infamous press conference where Donald Rumsfeld tried, unconvincingly for some, to outline the difficulties of acquiring and assessing intelligence reports in a war situation, The Unknown Known is the latest Errol Morris documentary to tackle a controversial figure, and the morally divisive situations that surround them. The figure is Rumsfeld, the former Secretary for Defence of the United States, during the years after September 11th, and the situations are the Invasions of Afghanistan and Iraq. Donald Rumsfeld’s name is etched in the mind of a generation, for better or for worse. Even people with little or no knowledge or engagement with politics are apt to recognise him. Knowing what is known about the warped path to the 2003 invasion of Iraq, he is the kind of person that some people feel comfortable describing as "evil". The man presented in this documentary however is not actively evil or villainous. If you’re interested in global politics, or the personalities that make history, or heady questions of morality and duty, then you will find The Unknown Known compelling. The obvious model for this movie is Errol Morris’ previous Oscar winning effort, The Fog of War, which was a truly ground-breaking film, a feature length interview with Robert McNamara, the former Secretary of Defence under President John Kennedy. McNamara presided over the first great escalations of the American campaign in Vietnam, and adopted what was at the time an "all-mod-cons" technocratic approach to winning the war with weapons of mass destruction. The Fog of War: Eleven Lessons from the Life of Robert S McNamara was almost vertigo-inducing in the sense it provided of how small rational decisions can have vast and horrifying consequences. 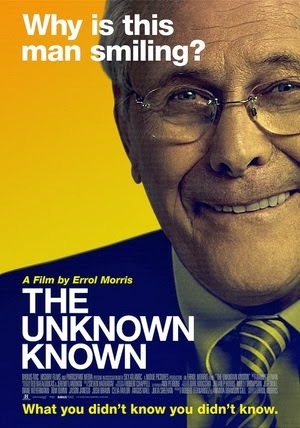 There is a hint at the end of The Unknown Known that Morris was approached by Rumsfeld with the idea of making this film, presumably influenced by a viewing of The Fog of War. I assume this, as it seems in step with the character of the man presented over the course of this latest film. A strong sense of the intelligence of Donald “Call me Don” Rumsfeld is communicated. We’re given a brief tour of his resumé with many tantalising indications that he may be misrepresenting his history. Indeed, there are a few places where Rumsfeld brazenly lies, and the film shows us this at times, rather than telling us. Morris opts for a briskly edited stock footage and collage approach to conveying the material, with no voice over. However, there’s also a sense of Morris being less invisible than in the McNamara film. He seems more involved, and the filmic flourishes towards the end of the film, animations and artful montages, become more propagandistic. There are two conflicting agendas, maybe, at the heart of this film. On the one hand, Rumsfeld is trying to create an apologia for his time as George Bush Jnr’s Secretary of Defence, in the style of his Kennedy-era predecessor, who managed to seem monstrous but also somehow ennobled by the end of his interview. Errol Morris, for his part, wants to train a camera on a man whose career and character will be debated at length for generations to come. Aside from the elephants in the room – 9/11 and the misrepresentations of evidence linking Iraq to the 9/11 attacks – there are a few glimpses behind the scenes of Washington in the 1970s. American history buffs and connoisseurs of conspiracy will get a kick out of hearing that Rumsfeld’s office in the post-Nixon years was where Al Haig kept his safe, which in the context is a little like finding out that the hangar where your rich uncle keeps his plane is where they stored the remains of the Roswell crash. Donald Rumsfeld was actually on site in the Pentagon on the morning of September 11th 2001, and his recounting of that morning is lucid and oddly touching in what it implies rather than directly states. At 105 minutes, this film is just about the right length but quite late in the runtime Morris really begins to hit his stride with the imagery, developing poetic visual counterpoints to the recurrent topics and themes that arise from the interview. As the situation in Iraq becomes more and more ungovernable, a swamp is presented; as Rumsfeld’s already prolific memo writing reaches new levels of output, the image of an ocean recurs, which in itself connects to another detail from earlier in the film. There is a sense that the film is only hitting its stride visually when it reaches its end. I would have watched this as a longer series but if it had been that long I think Don Rumsfeld – smart, shrewd and somehow affable- would have dug himself too deep a hole to get out of.